Swisswings was founded as Air Engiadina and operated the Dornier Do.328 (which has a cat-like appearance, in my view, a very nice looking airplane). This photo shows Fairchild-Dornier Do.328-110 HB-AEI (c/n 3041) while on finals into Amsterdam-Schiphol in February 2000. 1987 Air Engiadina was founded in St. Moritz on April 22. 1988 First scheduled flights from Zurich to St. Moritz/Samedan. 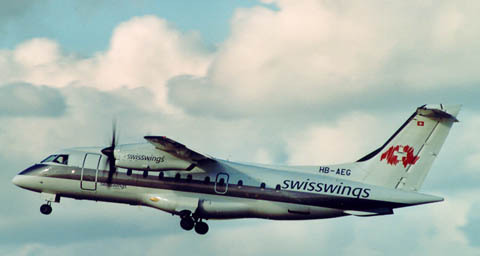 1992 The route Berne-Munich was opened using Fairchild-Dornier Do.228 aircraft. 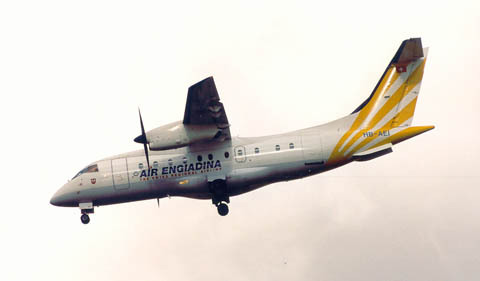 1993 Air Engiadina is the launch customer of Fairchild-Dornier Do.328-100. It adds the Berne-Vienna route. 1994 New homebase is Berne. After the delivery of its second Do.328, new route to Amsterdam is added. 1995 Delivery of two more Do328s. New route to London City. 1996 One of the aircraft delivered in 1995 was based in Geneva for flights to Dublin. 1997 Budapest is now served from Geneva. 1998 KLM and Air Engiadina sign an cooperation agreement, but without financial participations. In September they welcome the 500.000th passenger. Air Engiadina is rebranded KLMalps/Air Engiadina. The aircraft are repainted to the KLM livery. KLMalps/Air Engiadina buys 49% of KLMalps/Air Alps Aviation which is operating flights from Austria to the KLM hub in Amsterdam. 1999 New codeshare agreement with Northwest Airlines. 2000 Venice, Marseilles and Toulouse are new destinations (codeshared with Crossair) flown from Geneva. In autumn Stuttgart and Brussels (from Berne) and Stuttgart and Florence (from Geneva) are added to the route network. Flights from Berne to Geneva are now operated. 2001 The routes from Berne to Brussels and Stuttgart and from Geneva to Budapest and Dublin are cancelled in March. The cooperation with KLM is limited to the Berne-Amsterdam route. Swisswings Airlines is the new name of the carrier. 2002 April 08th, Swisswings ceases operations and files for bankruptcy. This photo shows Do.328-110 HB-AEF (c/n 3017) while still in the colours of KLM/Air Alps but with small Swisswings titles on the fuselage (Dec. 20th 2001). 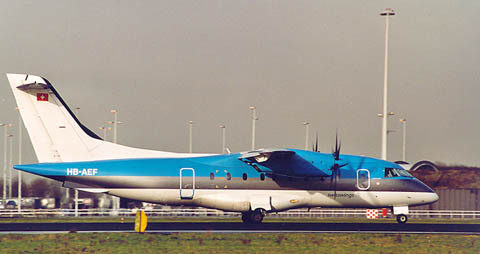 This photo of Do.328-110 HB-AEG (c/n 3011) was taken at Amsterdam-Schiphol on Oct. 28th 2001. It showes the final colorscheme of Swisswings, an improvement over the "KLM blue" livery (which, in my opinion, is becoming a bit boring and old fashioned). Unfortunately, it takes a lot more to survive in the aviation industry. The Swiss are a proud people and are able to reach a degree of perfection that has become proverbial. But in the aviation industry, companies must reach over their national borders and make alliances work, as this bankruptcy and the recent demise of Swissair has learned. "Air Engiadina has returned to the Swiss skies using 1 (SwissJet) Do.328 jet"